A lucky picture at Compton Beauchamp on 20 April 2015. 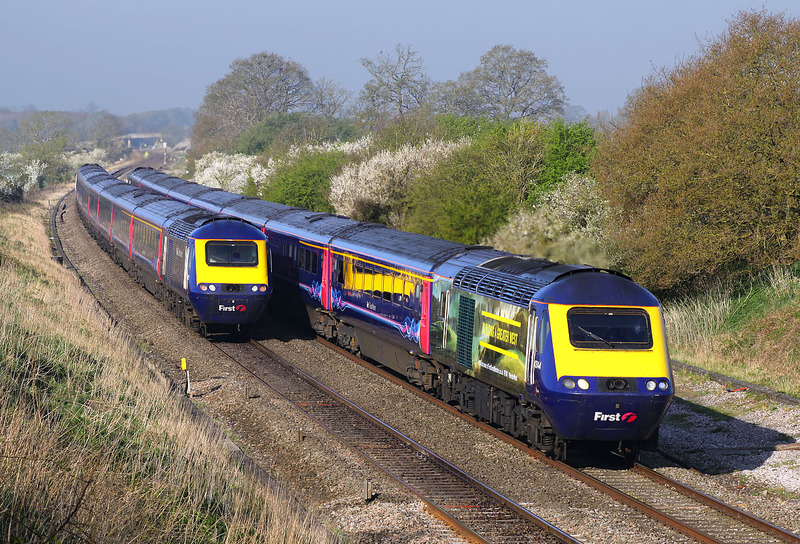 43144, with its 'Building A Greater West' vinyls, heads east with the 1L24 06:28 Swansea to Paddington First Great Western service, as the 1B10 07:45 Paddington to Swansea heads in the opposite direction, with 43015 bringing up the rear. Normally this kind of picture would show trains passing at a closing speed of approaching 250mph, but on this occasion neither HST was doing anything like 125mph. The London bound train is still accelerating away from a PW slack at Bourton, while the Swansea bound service is running under adverse signals, catching up with the 1G11 07:36 Paddington to Cheltenham Spa train.